Chronic obstructive pulmonary disease (COPD) is a major health problem which had not received the attention commensurate with the magnitude of its global burden. This is finally changing with the help of a vibrant community of health-care professionals, public officials, and academic researchers. 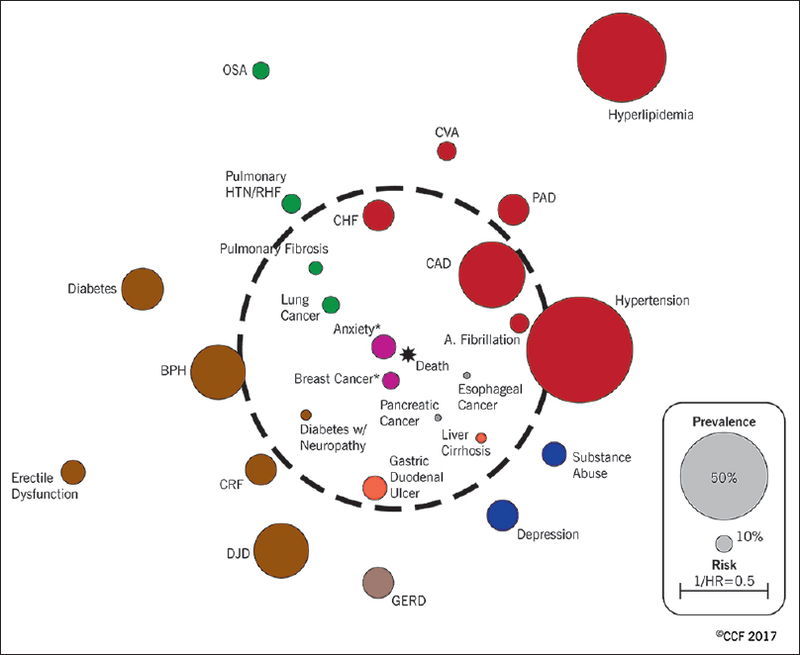 Advances in characterization of the disease, treatment options, imaging modalities, and better understanding of the comorbidities promise to revolutionize how the disease is managed. COPD should no longer augur despair among physicians and patients. BACKGROUND: Earlier studies showed a short-term impairment of cardio-autonomic functions following coronary artery bypass grafting (CABG). There is a lack of consistency in the time of recovery from this impairment. Studies have attributed the post-CABG atrial fibrillation to preexisting obstructive sleep apnea (OSA) without an objective sleep assessment. The aim of this study was to evaluate the effect of CABG on cardio-autonomic and hemodynamic functions and on OSA indices in patients with ischemic heart disease (IHD). 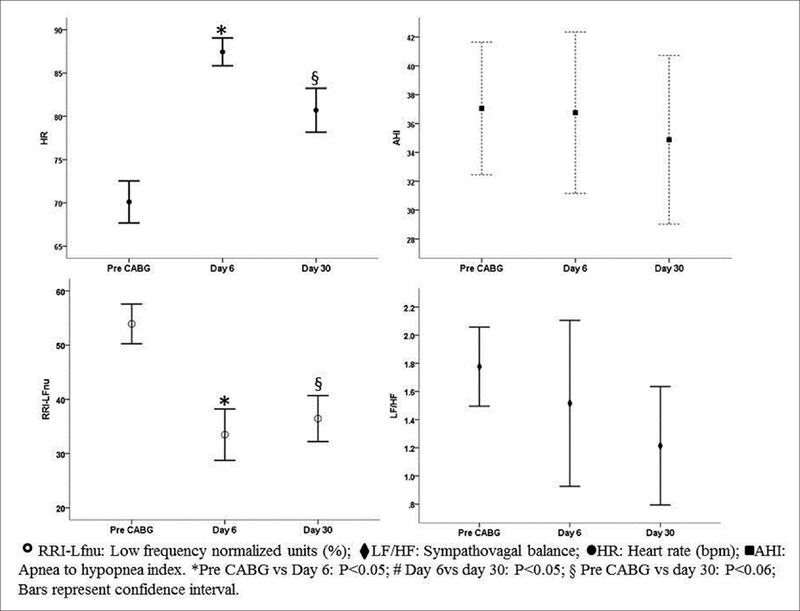 METHODS: Cardio-autonomic function using heart rate variability indices, hemodynamic parameters, and sleep studies were performed in 26 patients with stable IHD before, on day-6, and day-30 post-CABG surgery. RESULTS: The high-frequency powers of normalized R-R intervals significantly (P = 0.002) increased from the preoperative value of 46.09 to 66.52 on day-6 and remained unchanged on day-30 postsurgery. In contrary, the low-frequency powers of normalized R-R interval decreased from 53.91 to 33.48 during the same period (P = 0.002) and remained unchanged on day 30 postsurgery. Baroreceptor sensitivity, obstructive and central apnea indices, desaturation index, and lowest O2 saturation were not significantly different between preoperative, day-6, and day-30 postsurgery. CONCLUSION: Our study revealed that recovery of autonomic functions following CABG occurs as early as 30 days of postsurgery. CABG does not seem to have short-term effects on sleep study indices. However, long-term effects need further evaluation. BACKGROUND: Graphic warning labels have been shown to be effective in smoking initiation and cessation and were implemented in Saudi Arabia in 2012. To date, no study has assessed the effectiveness of these labels and the Saudi population's perceptions on the effectiveness of cigarette health warning labels. METHODS: We used a cross-sectional qualitative study comprising of nine focus groups among 3 different community group members including health-care workers, adult women and adult men. We conducted in-depth interviews among community leaders. 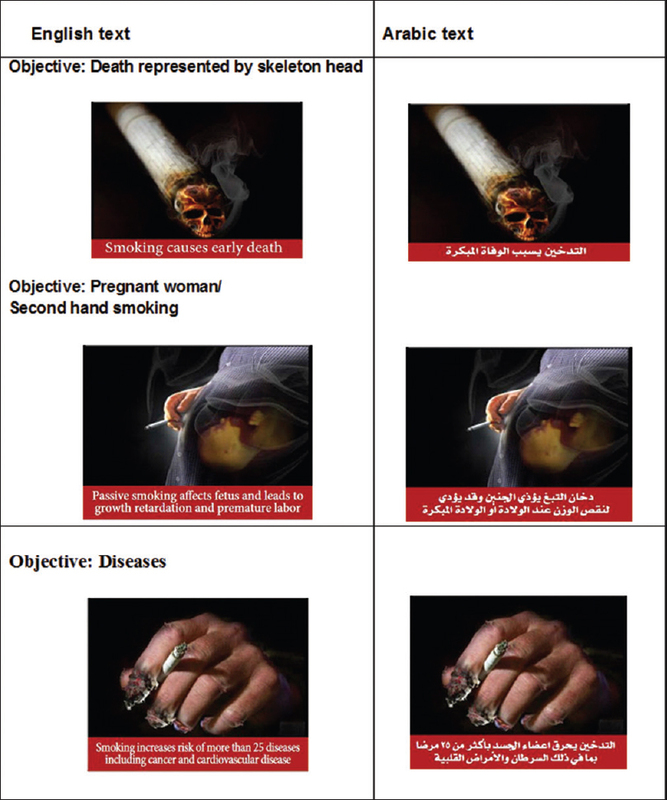 Both focus groups and interviews assessed awareness levels and elicited perceptions about health warning labels on cigarette boxes currently used in the Kingdom of Saudi Arabia. RESULTS: While most participants in the study were aware and supported the use of graphic warning labels on cigarette packages, the awareness of the specific details on the labels was low. Participants perceived the effectiveness of current labels somewhat vague in smoking cessation and advocated for stronger and more aggressive graphics. Community leaders, however, preferred text-only labels and did not support aggressive labels which were deemed culturally and religiously inappropriate. CONCLUSIONS: The study suggests that while graphic warning labels are perceived as necessary on cigarette packages the currently used messages are not clear and therefore do not serve their intended purposes. Measures should be undertaken to ensure that pictorial cigarette labels used in Saudi Arabia are culturally and ethnically appropriate and are rotated on a regular basis to ensure salience among smokers and nonsmokers alike. 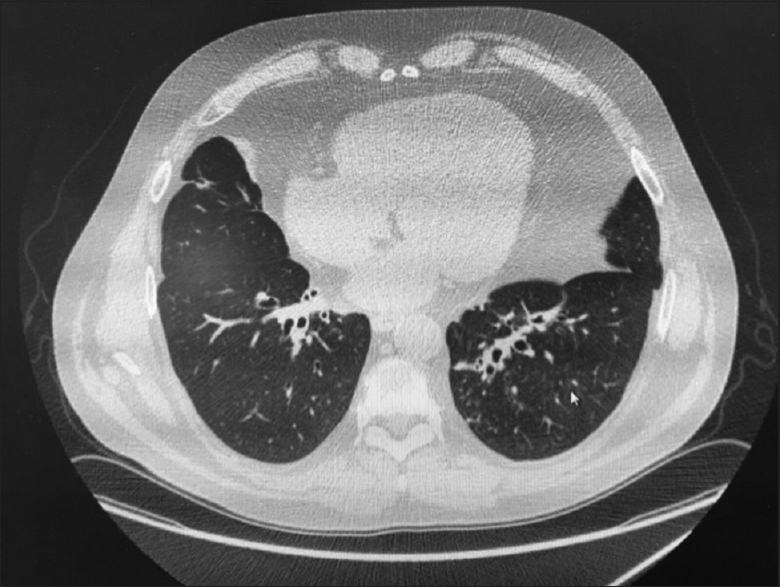 BACKGROUND: Primary pulmonary lymphoepithelioma-like carcinoma (PPLELC) is a rare subtype of nonsmall cell lung cancer (NSCLC) predominantly reported in East Asia. We aimed to evaluate clinical characteristics, diagnosis, treatment, and prognosis of PPLELC in Singapore. METHODS: Retrospective review of all patients diagnosed with PPLELC at our center between 2000 and 2014. RESULTS: All 28 patients were Chinese, 67.9% were female, and the median age was 58 years (range37–76 years). Majority (89.3%) were never smokers and 53.6% asymptomatic at diagnosis. About 28.6% presented with Stage I/II disease, 25% had Stage III disease, and 46.4% had Stage IV disease. All patients with Stage I/II disease underwent lobectomy without adjuvant treatment. Four out of 7 patients with Stage III disease underwent surgery with or without adjuvant therapy while the rest received chemoradiation. Twelve out of 13 patients with Stage IV disease received chemotherapy with or without radiotherapy. At the end of 2016, survival data were available for all 28 patients. Two-year survival rates for Stage I/II, Stage III, and Stage IV disease were 100%, 85.7%, and 61.5%, respectively, while survival was 100%, 85.7%, and 9.6%, respectively, at five years. CONCLUSION: The majority (46.4%) of patients presented with metastatic disease. For those with Stage I-III disease, 5-year survival for PPLELC was better than other NSCLC subtypes. Multimodality treatment including surgery could be considered in locally advanced disease. In Stage IV disease, it tended to approximate that of NSCLC. OBJECTIVES: We aimed to evaluate the seasonal variations of acute asthma presentation in children and the utility of the pediatric asthma score (PAS) and its components in early admission prediction. METHODS: As part of a randomized controlled trial addressing the clinical efficacy of budesonide nebulization in the treatment of acute asthma in children, the PAS was measured at baseline, 1st, 2nd, 3rd, and 4th h from the start of medications. Decision of admission was taken at or beyond the 2nd h. RESULTS: Out of a total 906 emergency department (ED) visits with moderate-to-severe acute asthma, 157 children were admitted. June to September had the lowest number of visits. 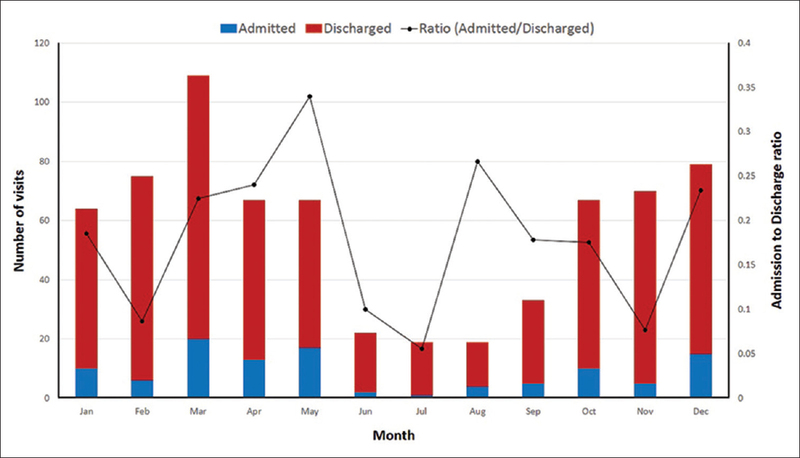 The admission-to-discharge ratio varied throughout the year. During the ED stay, between baseline and 3rd h, admission predictability of the total score improved progressively with a small difference between the 2nd and 3rd h. The total score remained the strongest predictor of admission at every time point compared to its individual components. The drop of PAS from baseline to the 2nd h was not a good predictor of admission. Oxygen saturation (OS) and respiratory rate (RR) had relatively higher predictability than other components. CONCLUSIONS: Decision of admission could be made to many children with moderate-to-severe acute asthma at the 2nd h of ED stay based on their total PAS. OS and RR should be part of any scoring system to evaluate acute asthma in children. AIM: We aimed to compare the clinical, epidemiological, and polysomnographic features of rapid eye movement (REM)-dependent obstructive sleep apnea syndrome (OSAS) and positional OSAS which are two separate clinical entities. METHODS: Between January 2014 and December 2015, at the Akdeniz University Medical Faculty Hospital, patients who were diagnosed REM-dependent and positional OSAS with polysomnography were retrospectively studied. RESULTS: In this study, 1727 patients were screened consecutively. Five hundred and eighty-four patients were included in the study. Of the patients, 24.6% (140) were diagnosed with REM-dependent OSAS and 75.4% (444) were diagnosed as positional OSAS. Female predominance was found in REM-dependent OSAS (P < 0.001). The mean total apnea–hypopnea index (AHI), non-REM AHI, and supine AHI in REM-dependent OSAS were 14.73, 9.24, and 17.73, respectively, and these values were significantly lower when compared with positional OSAS (P < 0.001). Patients diagnosed with REM-dependent OSAS had a statistically significant tendency to be overweight (P < 0.001). For REM-dependent OSAS, total pulse rate, supine pulse rate, and REM pulse rate were statistically higher than positional OSAS (P < 0.001). CONCLUSION: Positional OSAS is a clinical entity that is more common than REM-dependent OSAS. OSAS severity is higher in positional OSAS than REM-dependent OSAS. 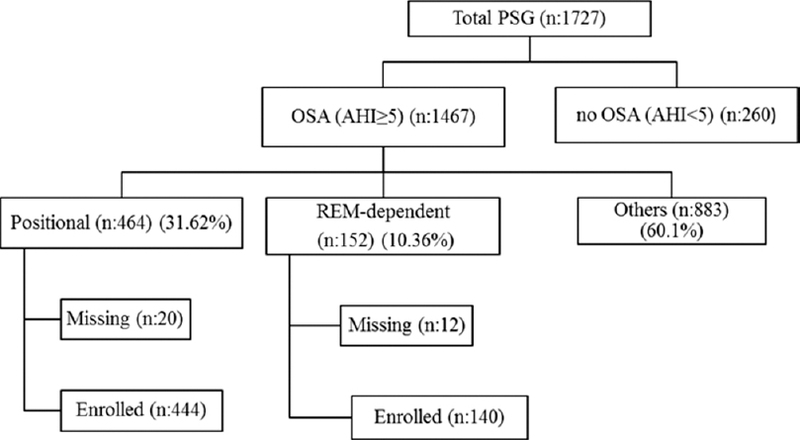 REM-dependent OSAS is observed more commonly in women. BACKGROUND: Food restriction has been demonstrated to increase the alertness in different species and to increase the levels of the wake-promoting neurotransmitter orexin. We hypothesized that diurnal intermittent fasting (DIF) increases orexin-A levels during fasting. Therefore, we conducted this study to assess the effects of DIF, during the month of Ramadan, on orexin, while controlling for lifestyle changes that may accompany Ramadan such as sleep duration, bedtime and wake time, energy expenditure, light exposure, and food. 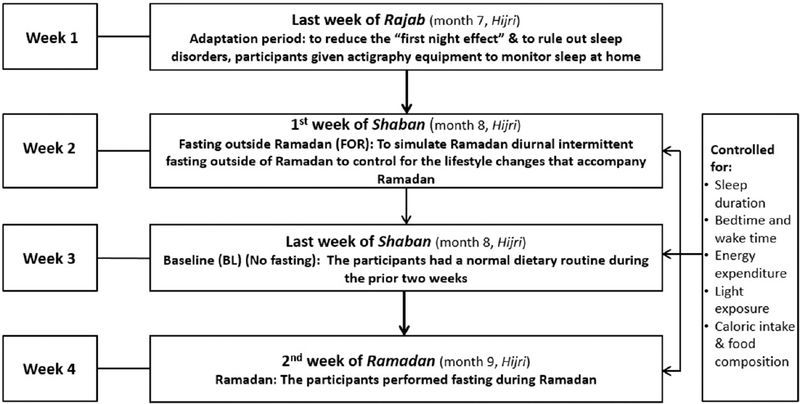 METHODS: Eight young healthy volunteers (mean age, 25.4 ± 3.5 years) reported to the laboratory on three occasions: (1) 4 weeks before Ramadan while performing DIF for 1 week outside the month of Ramadan (fasting outside Ramadan); (2) 1 week before Ramadan (nonfasting baseline) (BL); and (3) during the 2nd week of Ramadan while performing DIF (Ramadan). Plasma levels of orexin-A were measured using an enzyme immunoassay five times at 22:00, 02:00, 04:00, 06:00, and 11:00. Caloric intake, light exposure, and sleep schedule were maintained during the participants' stays in the laboratory in the three study periods. RESULTS: Orexin-A levels increased in the daytime during fasting and decreased at night compared to BL. The differences in orexin-A levels between DIF and BL were significant at 06:00, 11:00, 22:00, and 02:00. CONCLUSIONS: DIF increases orexin-A levels in the plasma during fasting hours. This finding supports findings from animal studies showing that fasting increases alertness. Partial anomalous pulmonary venous drainage (PAPVD) is a rare congenital cardiac defect and is associated with sinus venosus atrial septal defect. While most cases are asymptomatic, a patient can present with pulmonary hypertension (PHTN) and it can be difficult to diagnose. 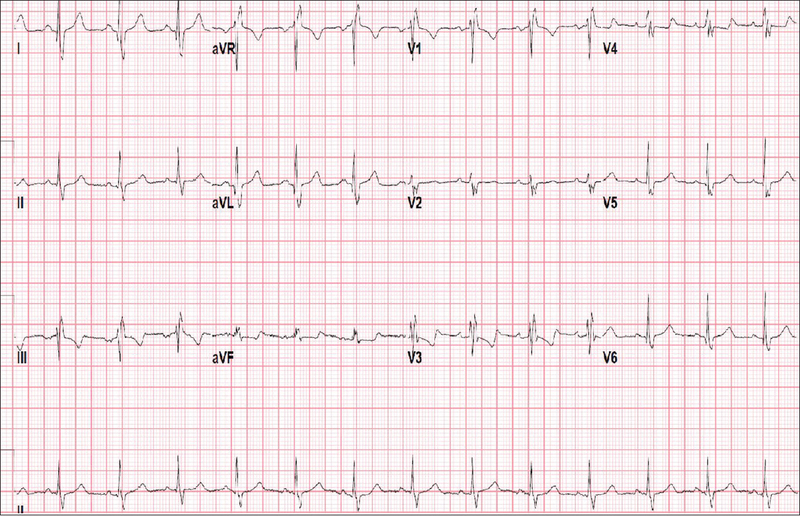 Here, we discuss the case of a young female with PHTN who was found to have two right-sided PAPVD. Through this case, authors try to emphasize the importance of meticulous and thorough investigation when evaluating PHTN, which allows for correct diagnosis and a timely intervention before PHTN becomes irreversible. Alpha-1 antitrypsin deficiency is a rare and often underdiagnosed hereditary disorder, which mainly affects the Caucasian population. 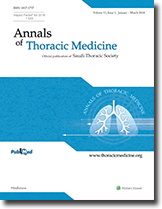 We report a case of a noncystic fibrosis bronchiectasis patient in the absence of emphysema associated with low serum alpha-1-antitrypsin (AAT) level, in the absence of the most common defective alleles associated with AAT deficiency (PI*S and PI*Z) but with a new mutation in heterozygosis. This mutation is characterized by the substitution in the coding region of exon 3, of a guanine (G) for a thymine (T), generating the replacement of a glutamine (Gln) by a histidine (His) in codon 212 (cod 212 GlnCAG > HisCAT), corresponds to a new S allelic variant. This mutation, never identified before, is called S-Napoli.